What It Is? A documentary about the guerilla art of street painting. At least on the surface it would appear this way. What it really is is more a satire on the elitist art community. We have Thierry Guetta, who in a weird character flaw, he is always recording aspects of his life. He meets up with a street artist known as “Space Invader” whom he met through his brother. What Thierry was introduced to was the world of street art. He would go on to record artist creating including Shepard Fairey. Fairey, known for his now infamous red, white, and blue photo of President Barack Obama. As well as the ever elusive british street artist Banksy. All three men think Guetta is going to use this for a documentary (because that’s what he told them.) when in reality he’s just filming to film. It’s not until Guetta tries to make art under the monarch of Mr. Brainwash that we see that Banksy is now controlling the direction of our onscreen adventure. What We Think? If I don’t see this film nominated for Best Documentary come Oscar time it will be a serious injustice. Entertaining, engaging, and funny as hell. These are not typically attributes we think of when we talk documentaries, yet this one has all three. What starts as footage shot by a mentally unstable Frenchmen, quickly and unexpectedly turns into a satire. And puts the question of “What constitutes art?” into paradox. As Mr. Brainwash gains fame Guetta’s ego get bigger and bigger. With this he begins to plan his first art show. MBW’s style only “slightly” resembles that of the late Andy Warhol. As the show is forming Guetta enlist the help of Banksy, Fairey, and others to promote the show. However Guetta quickly lets his ego take over. Our Score: A+, This is the must see doc of 2010. Much like last years Best Documentary winner The Cove this film gives us a look into something we do not always get to look at. 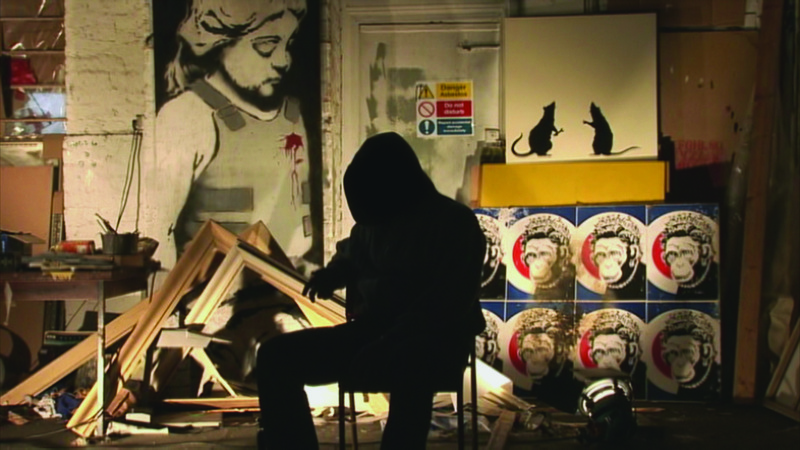 Exit is both documentary as well as a look into the world of street art. We recommend this film to anyone who really needs to a good laugh. Whether it’s a legit doc or not its still an excellent film.